When 4.0 Wisconsin senior team member Claire Calligure was diagnosed with breast cancer in Spring 2006, her teammates wanted Claire to know they care for her. Captain Deb Heller decided to make a quilt which could lift her spirits and bring her through the tough times. Deb cut up old USTA League tennis t-shirts from team members who received them competing at District, State, Section and National USTA League Championships the past five years. 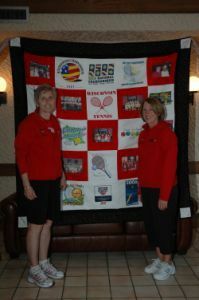 The team told Claire it was her passion for tennis that led them to create the quilt. Along with the last five years playing together and winning league titles, the team was blessed with the gift of lasting friendships. Claire finished a full chemotherapy regime earlier this year, and is now back to playing tennis. She played in a few local matches this summer, and is ready this weekend if the team needs her to fill in. When she experienced bad days during her cancer illness and chemotherapy Claire said she would wrap the quilt around her and feel the love of her teammates. It was like getting a great big hug every time she needed one. The team hopes to celebrate Claire's road to recovery with some victories this weekend and a trip back to the national championships.